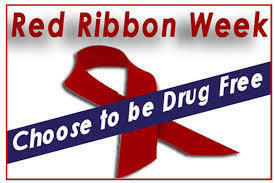 Red Ribbon Week is the LARGEST drug prevention campaign in the nation. The theme this year is Life is Your Journey, Travel Drug Free. Fact: Children of parents who talk to their children regularly about drug use are 42% less likely to use drugs than those that don't. Our school will celebrate Red Ribbon Week on October 29-31. Our school will be focusing on activities and class discussion regarding the harmful effects of drugs and bullying. We encourage the students to participate in the following activities during the week. Monday- Live a Healthy Lifestyle-Wear your workout/jogging clothing. It is our intent that parents will use these activities to initiate a conversation to discuss with your child the harmful effects of alcohol and drug use and encourage a healthy lifestyle.